1955 Tour de France. Stage 11, Marseille-Avignon. The Pandora’s box opens! 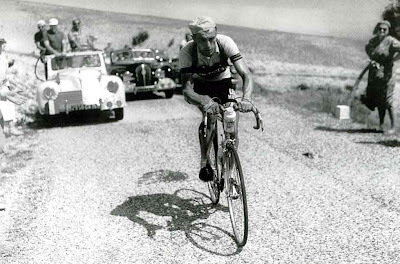 Louison Bobet rode patiently up a scorching hot Mount Ventoux with the thought of stealing time on his closest rivals. Namely, climbing sensation Charly Gaul and maillot jaune, Jean Brankart of Belgium. Bobet looked surprisingly good as he passed a tiring Gaul and preceded on alone to Avignon. Little did he know what was happening behind him! With 10 kilometers from the sun drenched summit, Malléjac falls off his bike and onto the boulders. One foot was attached to a pedal while the other still pedaled on continuously. Sweat poured from his face as he fainted and hit the ground looking eerily pale as if death kissed him. It was a chaotic scene as Dr. Dumas had to pry his jaw to get him to drink. About 15 minutes later, Malléjac awoke in the ambulance screaming, wanting to jump back on his bike. He was restrained and taken to hospital. Dr. Pierre Dumas had suspicion that Malléjac fainted from dope induced overexertion. In fact, a half a dozen other riders collapse in the sickening heat. It may have been amphetamines. Malléjac would recover and ride the Tour 4 more times retiring from cycling in 1959. And right up to his death in 2000, he denied drug use. Jean Malléjac was from the old school where outspokenness of doping was reserved to the quiet confines behind closed doors. Twelve years later, on the very same Mt. Ventoux, Tom Simpson would enter into Tour history! World champion, Bobet makes a break alone on the sun drenched bald mountain! He would go on to win the stage and the overall, without pleasure. He rode this Tour with painful saddle boils. And at the end of the year had an operation which required 150 stitches! 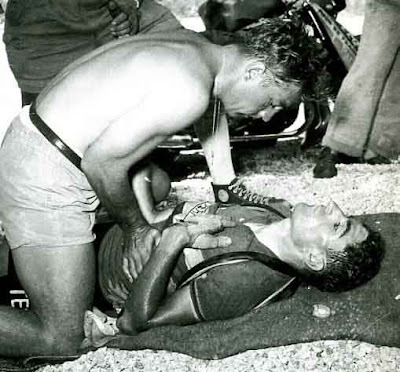 (Top photo): Dr. Pierre Dumas treats a comatose Jean Malléjac after his mysterious collapse climbing the giant of Provence.